This review is going to take a look at a Z-Wave capable device that is a bit different than the bulk of the other home automation devices we have checked out to date. 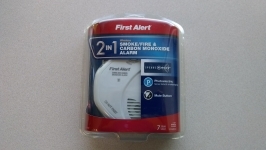 The First Alert Z-Wave smoke and carbon monoxide detector is exactly what the name implies - a combination smoke and CO detector that can be paired with select Z-Wave controllers to make them smarter than your typical detectors. Not only will you get local alarms for smoke and CO, but you can have your Z-Wave controller trigger other actions, such as sending you a push notification or SMS, triggering your home monitoring system, sounding a whole house alarm, turning on lights, unlocking doors, and so on. We will take a look at one of these units connected to a Samsung SmartThings system, but first let's cover some published data on the detector, as taken from the listing at Amazon.com. 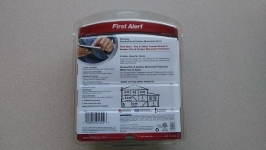 The First Alert Z-Wave smoke and carbon monoxide detector is sold in a plastic blister as shown in the images below. You get a good look at the item itself, and the paper inserts provide plenty of information about the product on both the front and back sides. Inside of the packaging you get the items shown below. 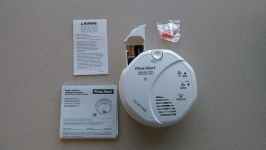 There is a user's manual, information sheet about Carbon Monoxide, the detector, two AA batteries, and some screws/anchors for installation purposes. All you need is a compatible Z-Wave controller, and you are all set to use this product to its full potential. 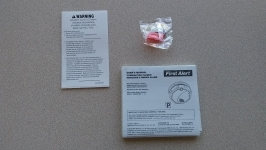 You could install these as stand alone detectors, without making a Z-Wave connection, but you could probably choose a less expensive detector.